Had a "Canning Across America" party this weekend and every inch of counter space was sticky by the end of the day. We started around 10 and finished after 5... a long, sweet day. As much as I enjoyed it, I don't know if/when I'll do it again. Especially as a solitary project. What made it so enjoyable was the good company and the team work. Everybody pitched in to tackle 40 pounds of peaches and 20 pounds of green beans. Which, it turns out, isn't as much as you might image. My friend Laura, aka the Canning Queen, said she usually does 100 pounds of peaches in a day! Oh my. The peaches were absolutely beautiful, golden, juicy orbs that will be most appreciated in the dead of winter. That's really the incentive, isn't it? It's not exactly something you do to flex your thrifty muscle, is it? Adding it all up, the cost of the jars, the sugar, the fruit, the time spent prepping and cleaning and cleaning some more, it doesn't really pencil out. Unless you're canning free fruit. Or you become so proficient that you can tackle a project and get 'er done in a couple of hours. Maybe it's like any other cooking? The more you do it, the more accomplished you become. Me? I've still got a couple dozen jars to fill. Searching for something to put in them. 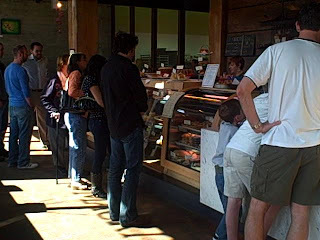 When I moved back to the Northwest in 2007, after three delicious years in Memphis, I probably gained 10 pounds eating my way through the spectacular pastries and artisan breads at Macrina Bakery. I’m crazy about the cookies and the cupcakes and the scones. I’ve ordered layer cakes for special occasions and have cashed in quite a few “buy 12 loaves, get one free” cards. I don’t know if I could pick a favorite. Owner Leslie Mackie didn’t hesitate when I asked her top picks for loaves and sweets: the seeded baguette and the fresh fruit coffee cake. Tomorrow, Macrina celebrates its 16th birthday by treating customers to a cup of coffee. Sweet! Macrina started small, doing mostly breads in a teeny 847 square feet space. Just one bench for seating. The operation has grown to three locations, each with its own charms. Lately, I’ve been drawn to the SODO spot (in the photo above) because I love watching the crew working the dough through the windows into the huge production space. A good reminder, Mackie said, that everything’s made by hand. 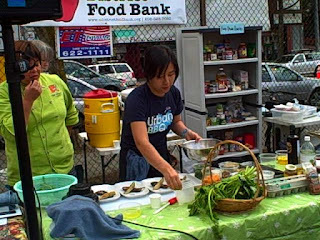 Had an absolute blast at the Ready, Set, Go... Cook competition at the U-District Farmers Market today, an annual event that's a fresh take on the Iron Chef. This year, there was a twist. In addition to shopping at this incredible market, chefs had access to some pantry items from the U-District Food Bank. Today's winner, Rachel Yang from Joule, took advantage of the eclectic selection and incorporated, among other things, some Spam. She made a lovely congee and folded in chopped zucchini vines, diced zucchini and finished the dish by sauteeing diced Spam, yellow squash, fried squash blossoms and, then, the brilliant finishing touch: an egg yolk "cured" in soy sauce. Wow. I was so impressed. She also made a pan-roasted veggie salad with Japanese eggplant, which she scored, so it cooked more quickly, and wedges of fennel. She finished that with some purslane, a green that looks like a weed, but has a nice citrus-y flavor. Really inspiring to see the way the pros use the incredible raw materials. Great job!! And, by the way, Joule's Sunday series continues tomorrow with JFC: Joule Fried Chicken! Heck yeah, I'm going! You? Just spent a few amazing days at the Quillisascut Farm School of the Domestic Arts and I'm still high from the good vibrations. It was an amazing learning experience. Tough and tiring, but really rewarding. I wasn't sure what to expect when we rolled up after a nearly six-hour drive from Seattle. That included a pit stop at the still-adorable Billy Burger in Wilbur. When I lived in Spokane, I made many journeys through Washington's wheat country on Highway 2 and this trip brought back loads of happy memories. During the four days of Farm Culinary 101, we did all sorts of chores, but there were times for reading and reflection. I loved sitting on the deck (the view pictured above) and listening to the birds and the soft wind moving the leaves on the trees. As we went around the table during our final morning meeting, we talked about the word grateful. I said I was grateful to reconnect to my sense of smell, triggered by the barnyard perfume of compost, the sweetness of lavendar, the intoxicating aroma of bread baking and the odor of sauerkraut fermenting. I forgot to include how grateful I was to go and jump in Lake Roosevelt after a sweaty afternoon of wandering orchards or pulling weeds. What made this such a powerful experience was sharing it with strangers who became fast friends. The first night was quiet polite conversation, the last was filled with laughter and one wild prank. (Sorry, I'm sworn to secrecy.) There are few times in your adult life when you can give in to child-like feelings of joy and this was one. Only trouble is, now I'm missing life the farm. I feel like I'm going through withdrawl.